Winner just over one year ago when beating colleague Yan An in the final, China’s Lin Gaoyuan defends his Men’s Singles title at the forthcoming Seamaster 2018 ITTF World Tour Platinum Liebherr Austrian Open. Play commences in Linz on Thursday 8th November, being preceded by a two day qualification tournament. Not only does Lin Gaoyuan defend his title but by competing, he books his place in the US$ 1,000,000 Seamaster 2018 ITTF World Tour Grand Finals to be staged in December in Incheon, Korea Republic. Currently on the Men’s Singles Standings he is listed at no.5 (616 points), by competing in Austria, he will complete the minimum five appearance criteria and will reserve an invitation for Incheon. However, for the most successful player at an ITTF World Tour tournament in Austria, a repeat performance is required. Germany’s Timo Boll is the only player to win the Men’s Singles title on more than one occasion; he won in 2002, 2004 and 2008, whilst being the runner up in 2010. Similar to Lin Gaoyuan, he will meet the five appearance criteria by competing in Linz but presently on the Standings is named at no.21 (236 points), in order to claim one of the 16 places in Incheon, a quarter-final finish might just be good enough, in realistic terms, he needs to progress to the semi-finals. In Incheon, Timo Boll is the no.3 seed, behind China’s Fan Zhendong and Xu Xin; similar to Lin Gaoyuan, Fan Zhendong (1,300 points) will complete the five appearance criteria and like Xu Xin (1,450 points) is assured of a place in the Grand Finals. Likewise, also from China, Ma Long (1,039 points), Korea Republic’s Lee Sangsu (419 points) and Brazil’s Hugo Calderano (538 points), alongside the Japanese duo of Tomokazu Harimoto (809 points) and Jun Mizutani (441 points) are all guaranteed invitations to Incheon. All appear amongst the seeded names in Linz. However, for Germany’s Dimitrij Ovtcharov, the no.4 seed, presently listed at no.29 on the Standings (178 points), a semi-final place might just be enough by the skin of his teeth but he will need other results to go his way. Meanwhile, for Hong Kong’s Wong Chun Ting, the no.9 seed and Japan’s Koki Niwa, the no.10 seed, a place in the Grand Finals is not yet assured. On the Standings, Wong Chun Ting presently occupies the no.13 spot (407 points), if he performs according to expectations, a place in Incheon is very much on the cards. It is less certain for Japan’s Koki Niwa, the no.10 seed in Linz; on the Standings he is named at no.16 (264 points), the last place for an invitation. Good performances from Chinese Taipei’s Chuang Chih-Yuan, the no.13 seed and Portugal’s Marcos Freitas, the no.14 seed, could well halt the ambitions of Koki Niwa. Neither is out of the running; on the Standings, Chuang Chih-Yuan is listed at no.17 (279 points), Marcos Freitas at no.19 (264 points). Doubts regarding qualification for the Grand Finals for seeded players in Austria; for four players who must compete in the preliminary stages, their places in Incheon are guaranteed. The Korea Republic’s Jang Woojin (605 points) and Lim Jonghoon (462 points) are assured of an Incheon invitations as is Germany’s Patrick Franziska (461 points), whilst by competing in Linz, China’s Liang Jingkun (447 points) will complete the five appearance criteria and qualify. Equally, also required to compete in the preliminary rounds in Linz, progress to the main draw could well gain China’s Liu Dingshuo (371 points) and Japan’s Yuya Oshima (349 points), invitations for Incheon. 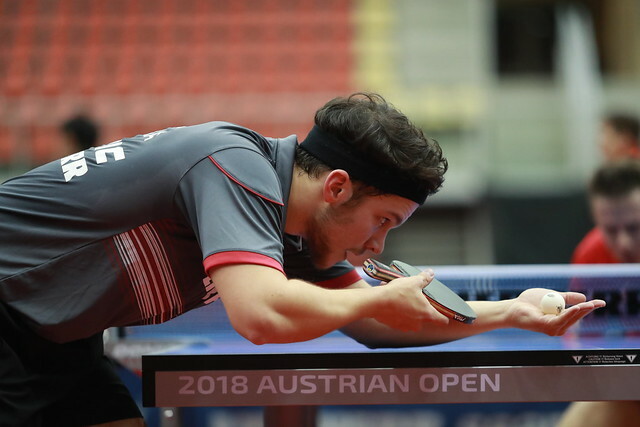 A calculator might well be useful at the Seamaster 2018 ITTF World Tour Platinum Liebherr Austrian Open.